There is nothing that warms my heart more than knowing that fall is just around the corner. I know that some people look forward to spring and all the wild flowers, some summer and trips to the beach (plus who doesn’t love a nice tan), but not this girl. Fall has my heart. Always has, and I am like 99.9% sure it always will. There is just not one thing that I dislike about the fall season. Plus, just think of all those amazing candle scents that come out each fall. Let me share with you why I am in love with this season…..
plus, lets not forget the friends that come together to watch football. I absolutely love spending Sunday’s with my roommate and friends watching, and my Thursday Night traditions with one of my best friends! Football brings entertainment, friends, laughs, excitement, delicious food, and tasty drinks. its the season for the leaves to start changing colors and making the Blue Ridge Mountains look GORGEOUS. I grew up in the GREAT state of New York- where there is pretty much nothing that compares to those autumn colors. But, I think if there is another place that comes close on the east coast, it is definitely in Virginia. I am surrounded by the Blue Ridge Mountains- and when all the leaves start changing colors, it shows just a glimpse of God’s beauty. You see bursts of color EVERYWHERE, but they mesh so well together. I seriously fill up my iphone library with pictures of trees, leaves, and the mountains. 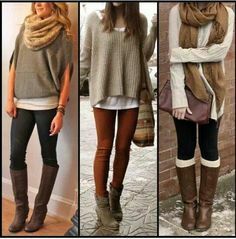 and lets not forget, boots & scarves come back into style in the fall! Boots. Boots. and more Boots! My favorite fall fashion involve, you guessed it, boots! Tall boots, short boots, brown boots, black boots, pretty much any boot. And we cannot forget about the amazing scarf fashion that comes out every year. Well, September 22 could NOT get here quick enough! I am so excited for my season to be just around the corner. Anyone excited with me?